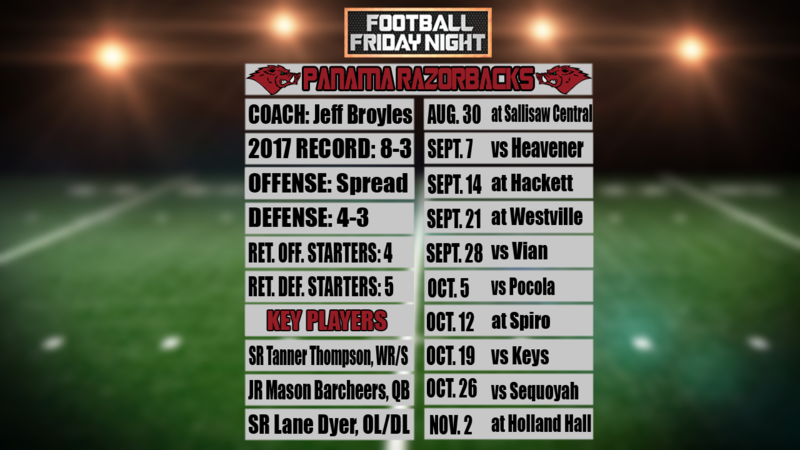 PANAMA, Okla. (KFSM) – Offense carried Jeff Broyles and Panama to the Oklahoma class 2A playoffs last season where the Razorbacks lost a competitive game to Vian 41-20. Now with nine starters back, ‘experts’ believe Panama will finish last in the 2A-5. “They don’t know us. People go off what coaches say but they haven’t seen us out here putting in work,” senior Chance Timms said. One reason Broyles thinks the Razorbacks can turn some heads is quarterback Mason Barcheers. As a sophomore, Barcheers only played defense. But it was clear that needed to change this fall. Barcheers walks into a good situation in the backfield. The junior will play behind a very experienced front five, as the Razorbacks return four out of five starters on offensive line, including senior Lane Dyer. Barcheers also can throw to a slew of receivers including senior Tanner Thompson. “He’s played receiver for three years and he’s catching everything,” coach Broyles said. Offense aside, Panama’s defense was the team’s weakness in 2017. That could change this fall. "Defensively right now we're flying around to the ball. That's probably where we were the weakest last year, but so far so good. We're gonna find out some more this Friday night in the scrimmage against Talihina," said Broyles. "We've been working on our mobility and different sets to goof teams up," Simkins added. "If they prepare for one set and we come out of another one, that really puts us ahead of a few teams because you really never see teams run five sets a game." "The VYPE Magazine had us picked last in our district, so don't count us out," said Broyles. "That's put a lot of fuel to the fire with these kids." "The first official game is so important," said Simkins. "It shows other teams how the season is gonna go. We set the tone in that game, we can show other teams that we're not the last team in our district. We've got something to prove this year." Panama opens up the 2018 season at Sallisaw Central on Thursday August 30. Conference play begins at Westville on September 21.